When you are expecting your body will go through a lot of changes. Some of those will appear in your oral cavity. It is very important to know what kind of changes will happen and to know the proper ways to take care of your oral health. There are many conditions that are related to pregnancy and appear more often in pregnant women. Some of these women get too obsessed with overthinking things about the baby and don’t pay too much attention to their teeth. The thing is that they don’t get how important the oral well-being is both for their body and for the baby. Why do These Changes Appear? The changes are a result of the many things that happen in the body of an expecting mom. First of all, the hormone levels are significantly altered. The hormonal changes lead to an increased blow flow in the oral tissues and also an immune system that is more susceptible to bacterial and fungal infections. Which are the Most Common Oral Problems During Pregnancy? This is by far, the most common problem that a lot of expecting moms experience. The wild hormones are responsible for this condition. 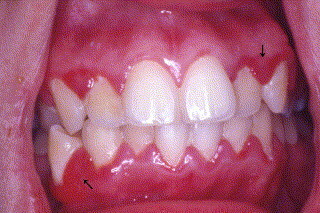 The symptoms are identical with the regular gingivitis. You will experience bleeding from the gums, especially when you are brushing your teeth. The gums will be red and inflamed. They will also be more susceptible to bacterial invasion. That is why the gingivitis should be treated from the start. If not it might progress to periodontal disease, which is very hard to control during pregnancy. The second trimester is the time when gingivitis is most likely to occur. If you notice any of these changes, you should schedule a visit to your dentist. The morning sickness and vomiting are the biggest enemies of your teeth. The acids that pass through your mouth are strong and can lead to dental erosion. You will experience bad breath and an unpleasant taste in your mouth. Although you might think that the best idea is to brush your teeth right after the vomiting, you shouldn’t do that. Because of the acids tooth’s structure is already weakened, by brushing your teeth immediately, you only damage the enamel even more. Instead, you should rinse your mouth with water several times. Baking soda is another good idea, that will help you restore the normal pH levels in the mouth. All you have to do is mix a tablespoon of baking soda with water and swish it in your mouth. This is only a temporary condition, but it is good to visit a dentist for further advice. Although the name might sound scary, these formations are not malignant and are only temporary in most cases. Pregnant women tend to develop these tumors during the second trimester. That is when they notice weird-looking lumps localized near the upper gum line. The gums will be red and inflamed, and the tumors look like raspberries. They might bleed and cause discomfort when eating or talking. The pregnancy tumors tend to disappear right after the baby is born. In the cases where they cause a lot of difficulties, the tumors can be removed. Unfortunately, expecting moms are at a greater risk of dental caries. This happens for several reasons. Because of the hormonal changes the body might have a lower ability to fight bacteria. Also, pregnant women tend to eat much more sugar, which is high on the list of risk factors for caries. Not having the proper oral hygiene is also a cause of tooth decay. Morning sickness and the acids that go through the mouth weaken the enamel. That increases the chances of getting dental caries. How to Deal with Oral Problems During Pregnancy? First and foremost, don’t ever forget to take care of your oral health. Providing the perfect oral hygiene is of utmost importance. You should schedule regular checkups with your dentist. He will be able to follow the changes in the mouth and give you advice on many topics. You should let him know that you are pregnant as soon as you know. That is important mostly because of medication. If he is prescribing you any medication, he should be aware of the fact that you are expecting. That way he can make sure that everything he does is safe for the baby. Antibiotics and pain medicine shouldn’t be prescribed during pregnancy. A lot of dental procedures should be avoided during pregnancy. Usually, dentists only do procedures that are necessary. The recommended time to get dental work done is the second trimester. But, it would be ideal if that could wait until the baby is born. If you are aware of any dental problems that you have and you are planning on having a baby, you should take care of your teeth first before getting pregnant. You will be advised to brush your teeth at least twice a day with a soft-bristled toothbrush. You should use floss to completely remove the tartar between your teeth. Pregnancy gingivitis is correlated with bad oral hygiene. Some of the studies even show that having gum disease during pregnancy is connected with the risk of a premature birth. Your diet has a huge impact on your teeth. You should avoid foods and drinks that contain a lot of sugar. All of the dental problems associated with pregnancy can be avoided with good oral hygiene and regular visits to the dental office. But if some of those occur, then you should go to the dentist as soon as possible. Gingivitis should be stopped and treated in the early stages before it progresses into periodontal disease. Pregnancy tumors are usually not treated, but if they cause a lot of discomforts they can be removed. In 50% of the treated cases, the tumors tend to appear again shortly after the removal. Right after the birth, these formations disappear.